Artist "Kian Soltani & Aaron Pilsan"
Rave reviews and invitations to perform at the world’s leading concert halls have propelled the 25-year-old musician from rising star to one of the most exciting musicians of this generation. 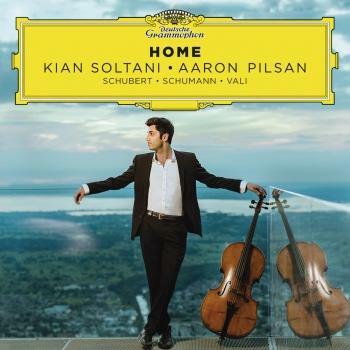 Kian Soltani made his international breakthrough at the age of nineteen with acclaimed debuts in the Vienna Musikverein’s Goldener Saal and at the Hohenems Schubertiade. He attracted further worldwide attention in April 2013 as winner of the International Paulo Cello Competition in Helsinki where he was hailed by Ostinato magazine as “a soloist of the highest level among the new generation of cellists”. In the summer of 2015 he joined Daniel Barenboim as one of the soloists in Beethoven’s Triple Concerto, performing the work during the West Eastern Divan Orchestra’s Waldbühnenkonzert in Berlin, at the Salzburg and Lucerne festivals, at the BBC Proms in London, and at the Teatro Colón in Buenos Aires. Highlights of the 2017/18 season include performances at the Alte Oper Frankfurt, Philharmonie de Paris, Royal Festival Hall London, Kölner Philharmonie, Boulez Saal Berlin, Prinzregententheater Munich, Oslo Konserthus and the Hohenems Schubertiade, as well as appearances at the Salzburg, Verbier, Lucerne and Aix-en- Provence Easter Festivals. He will again join Barenboim and the West Eastern Divan Orchestra performing Strauss’ Don Quixote on a worldwide tour throughout 2017. His debut Deutsche Grammophon album, “Home”, comprising works for cello and piano by Schubert, Schumann and Reza Vali, is set for international release in January 2018. Kian Soltani was born in Bregenz in 1992 to a family of Persian musicians. He began playing cello at an age four and was only twelve when he joined Ivan Monighetti’s class at the Basel Music Academy. He was chosen as an Anne-Sophie Mutter Foundation scholarship holder in 2014, and completed his further studies as a member of the Young Soloist Programme at Germany’s Kronberg Academy. He received additional important musical training at the International Music Academy in Liechtenstein. Kian Soltani plays on the “London” Stradivarius 1694 cello, on generous loan from the J & A Beare International Violin Society.